Toronto (ON), Canada — Zevrix Solutions, a developer of automation solutions for Adobe InDesign, PDF workflows and file delivery, announces today a holiday sale until January 6. Zevrix offers 50% discount on everything in its online store including product bundles and upgrades. The company’s products include several popular plug-ins for Adobe InDesign and Illustrator, which help professionals automate printing and exporting, repurpose files for web and mobile devices, save disk space and cut production costs. LinkOptimizer for InDesign, which reduces link size by eliminating excess image data, performs essential picture adjustments, and converts file formats. LinkOptimizer lets users save gigabytes of disk space, cut down on processing time and reduce production costs. Output Factory for InDesign, which automates printing and exporting and offers batch output, layer versioning, export as single pages, preflighting, variable file names and more. A server version that processes files from watched hot folders is also available. InPreflight for InDesign, which offers advanced preflighting as well as automatic packaging of multiple files. InPreflight helps users eliminate errors, save disk space and collect all linked files into a single location. Located in Toronto, Canada, Zevrix Solutions provides productivity solutions for Adobe Creative Suite software, graphic file diagnostics, PDF workflow, digital delivery, and Microsoft Office on Mac OS. Zevrix Solutions is dedicated to helping professionals achieve more while doing less through automating their everyday tasks, producing error-free documents, saving disk space and cutting production costs. For more information, visit http://www.zevrix.com. Salinas, CA , December 27, 2017 – The beginning of the year is a great time to start planning the details of your #weddingday, and Pinterest is the perfect place to check out the latest trends — from wedding activities to finding your something blue! The team at Hyatt Regency Monterey Hotel and Spa is here to make your dreams come true … so pin your favorites for a chance to win! Happy posting! Email a link your board to: marci@chatterboxpublicrelations.com. One lucky winner will receive a two-night stay at Hyatt Regency Monterey and romantic dinner with wine pairings at at TusCA! Winner will be announced February 5. The Monterey Museum of Art will launch a three-part lecture series in January 2018, about honoring women who have made a difference in the creative arts. Monterey, CA, December 24, 2017 — The Monterey Museum of Art will launch a three-part lecture series in January 2018, about honoring women who have made a difference in the creative arts. The series, “Women Who Have Made a Difference in the Creative Arts,” opens Monday, Jan. 22, with “Living the Handmade Artist’s Life” with Elizabeth Murray, followed by “Musically Speaking, Leadership in the Arts,” with Nicola Samra, Executive Director of the Monterey Symphony, on Monday, Jan. 29, and finally, in honor of Black History Month, “A Dramatic Presentation of ‘Corn Hollow’ ” with author LaVerne McLeod, on Monday, Feb. 5. All one-hour lectures will be held from 1-2 p.m. Mondays, at the museum’s 559 Pacific St. location. The lectures are free to museum members and free for non-members with general admission to the museum. Admission is $10 for adults and free for students and active duty military with I.D. and those 18 years and under. Visitors are welcome to bring food and drinks during this lunchtime lecture series. The first lecture features painter, photographer, author, international workshop leader, and gardener Murray, who will be sharing the stories of her life as a multi-faceted artist. Murray’s passion for nature and beauty has taken her around the world — from remote African villages and the Amazon rain forest, to Giverny, France, where she helped restore Monet’s Gardens — inspiring her to create a diverse range of art works. Today some of her work resides in permanent installments in corporate collections. As a popular keynote speaker, she uses the beauty of her photographic images, personal stories, garden metaphors, and humor, to inspire and connect her audience to what has meaning for them. Her goal is to help people express their own creativity in their work and personal lives. Today, Elizabeth Murray lives in an historic artist colony belonging to painter Charles Rollo Peters in Monterey. She has been restoring the house, cottages and gardens for the last 18 years. The author of nine books, including best-selling “Monet’s Passion,” “Living Life in Full Bloom,” and “Cultivating Sacred Space,” Elizabeth Murray finds the garden to be both a life-enriching art form, and a path to intimacy with nature. Nicola Samra will discuss the role of women in arts management — the challenges and the opportunities. She promises to address favorite topics such as “work/life balance,” and “successful fundraising tips.” She will also give her take on common questions such as “Is classical music is dying? “Can you have it all?” and “What is the role of art in society?. In the process, Samra will share her own path to becoming Executive Director, and the things she learned along the way. A classically trained violinist, Samra has performed, toured, or recorded with Mastodon, Sky Cries Mary, and Sera Cahoone, in addition to founding the all-female string trio, The Bella Trio. She previously held positions at the Carmel Bach Festival and California State University Monterey Bay, in the university’s development department. A Seattle native, Samra worked for the Seattle Chamber Music Society, the Women’s Medieval Choir, and The Bill and Melinda Gates Foundation. Samra holds degrees in Spanish Literature and Music History from the University of Puget Sound, and an advanced degree in Arts Administration from the University of Washington. In her spare time, Samra, along with her husband, Dr. Todd Samra, enjoy arguing about pronunciation and grammar, and playing Wiffleball with their three children, John (20), Connor (10) and Enzo (6). Through an interactive performance of her novel, “Corn Hollow,” author LaVerne McLeod will tell the story of a young African American girl living in the heart of Tennessee during the rise of the civil rights movement. The book is based on McLeod’s own experience with segregation in the American South. Using an innovative performance style, she will choose a chapter from her book, and bring the story to life by engaging the audience as participants. McLeod has lived in communities in various parts of the country, including Arkansas, Missouri, and Palo Alto. She earned a bachelor’s degree in education and a Master of Arts degree in Counselor Education from Southeast Missouri State University, with continuing education work from San Jose State University in California. She has lived in Big Sur since 1979, where she balances life as a wife, mother, educator, artist, and author. McLeod also has a rich history of leadership involvement with our community, including creating and facilitating Bridge Building to Equity workshops. The Song of Solomon, a book of the Bible, is a lyrical poem of King Solomon and is his masterpiece of all songs. First time author Brad Kuechler has a fresh new angle and sees the Song of Solomon as a true story that contains layers of deep spiritual meaning. Newport Beach, CA (USA), December 22, 2017 — The Song of Solomon, a book of the Bible, is a lyrical poem of King Solomon and is his masterpiece of all songs. First time author Brad Kuechler has a fresh new angle and sees the Song of Solomon as a true story that contains layers of deep spiritual meaning. Kuechler reveals that the story is actually about a young, dark woman from Shulam who was beautiful in every way. From the hair on her head to the footprints of her feet and from her heart to her character, she was fairer than any other woman. This young Shulamite woman was in love with a young shepherd who didn’t have much worldly wealth to offer her, but he was her beloved. They were made for each other, and they planned on spending the rest of their lives together. In fact, she was engaged to him. The only problem was that the king of Israel wanted her for himself. One day, as the king looked over his kingdom, he saw this woman who was beautiful in every way but engaged to the love of her life. The king wanted her, so he took her from her shepherd lover to add her to his collection of wives. This Shulamite woman would be his ultimate trophy. So, the king took her away and tried to get her to love him and forget her beloved. He offered her the very best the world and his version of church had to offer. He even seduced her with promises of the outward fruits of wealth, recognition, and a comfortable lifestyle. He gave her fragrant perfumes, spa treatments, unmatched wealth, and chef-prepared meals. This king was none other than King Solomon, and he is the villain of this story. Kuechler’s book The Chronicles of Solomon I Escape From Solomon’s Church: Song Of Solomon: An Epic Love Story Into The Heart Of God, covers the first two chapters of the Song of Solomon in which a rich king entices a young woman from her first love using the lure of great riches. If we examine the story further, we will find a lesson that teaches us to look beyond the surface of wealth and put our trust in God. In this story we read of a King who uses his power and riches to entice a beautiful young woman from Shulam to leave the one true love of her life. This story is not unlike what we are seeing in today’s culture; a world in which possessions, professional advancement and money are often used as the measuring tool to determine success. Whereas, in Kuechler’s book, he demonstrates that it is our inner faith and love in God that allows us to find rest in Him. 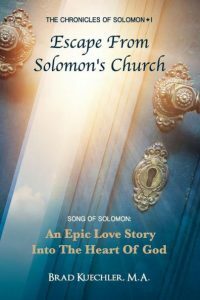 The Chronicles of Solomon I Escape From Solomon’s Church: Song Of Solomon: An Epic Love Story Into The Heart Of God is now available at Halo Publishing, Amazon and Barnes and Noble, in paperback for $21.95 and $9.99 for the e-book. Renowned florist and floral designer Teresa Sabankaya, founder and creative director of Bonny Doon Garden Company, will release her first book in the spring of 2019 on the Countryman Press imprint. Salinas, CA, December 24, 2017 – Renowned florist and floral designer Teresa Sabankaya, founder and creative director of Bonny Doon Garden Company, will release her first book in the spring of 2019 on the Countryman Press imprint. Sabankaya’s modern invention of a historic nosegay, Bonny Doon Posies, have been a core part of her retail business from the beginning, and have been featured in such media as CBS Sunday Morning, Romantic Homes magazine, San Francisco Chronicle, Santa Cruz Sentinel and The New York Times. This book is for all children who want to know just how special they are and what a difference they will make to the world someday. Deer Park, NY (USA), December 22, 2017 — If you have ever questioned your worth or wondered what made you unique, Alexandra Coutrier’s new children’s book has the message you need to hear. We all need to know that we are special and have value but often, especially when we are young, we don’t have anyone to tell us. This book is for all children who want to know just how special they are and what a difference they will make to the world someday. 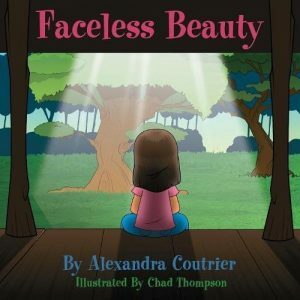 The main character in Faceless Beauty is a little girl who lives in the woods, insecure and unsure of her worth until one day a light shines down on her with a positive message. She is told that she is a child of God. She was made to be a light, with great purpose and value and should share her beauty with the world. The book has been written to allow parents to insert their own child’s name so that the message can be personalized. It is a unique opportunity to reinforce this positive message of love and encouragement with each child so that they might believe in their own value. “We’ve all felt that insecurity in our lives when we weren’t sure of our purpose or direction and Alexandra’s book is a wonderful way to help children, from an early age, believe in themselves and in their own value,” said Lisa Umina, founder and publisher, Halo Publishing International. Faceless Beauty is now available at Halo Publishing, Amazon and Barnes and Noble, in hard cover for $19.95, paperback for $12.95 and $9.95 for the e-book. Alexandra Coutrier is a warm and loving wife and mother, a woman with a passion to see people become who God made them to be. She has a love for uncovering the hidden potential in the lives of those whom the world has cast down, allowing them to uncover the gifts that lie within. Alex is on a mission to help others fulfill their potential and live out the best lives possible. The Monterey Museum of Art has announced that Monterey-based multi-media artist Hector Dionicio Mendoza will hold a one-month artist-in-residency and mixed-media art project starting Dec. 23. Monterey, CA, Dec. 22, 2017 — The Monterey Museum of Art has announced that Monterey-based multi-media artist Hector Dionicio Mendoza will hold a one-month artist-in-residency and mixed-media art project starting Dec. 23. When is artwork considered complete and ready to exhibit? What are the influences that dictate, inspire or inform a body of work? What role does the alchemy of materials play when creating art? How is the process of experimentation a major contributing factor for generating new art techniques and ideas?